the role of primary care in managing a person with a suspected TIA. P eople with transient ischaemic attack (TIA) have a very high early risk of stroke and are also at risk of myocardial infarction (MI) and vascular death. Transient ischaemic attacks can be difficult to diagnose as there is no specific diagnostic test, and there are pitfalls in their assessment, risk scoring, early management, and referral to specialist services. While missing a TIA can have serious consequences for the patient, misdiagnosing a non-cerebrovascular condition as a TIA leads to unnecessary anxiety, inappropriate management, needless restrictions on driving, and adverse insurance implications. In addition, the real diagnosis can be missed and inappropriate referrals to TIA clinics cause delays for those patients who are likely to benefit most from clinic management. associated national guidance and recommendations. A more recent tissue-based definition proposed by the American Heart Association is 'A transient episode of neurological dysfunction caused by a focal brain, spinal cord, or retinal ischaemia, without acute infarction'.3 This second definition relies on the use of early magnetic resonance (MRI) imaging,3 which is not always available in UK hospitals. The prevalence of prior TIA in patients who present with stroke has been reported to range from 7% to 40%3 and the risk of a stroke is highest in the first 24 hours after the TIA.4 The stroke risk after a TIA has been reported in studies to be 3.1% at 2 days, 5.2% at 7 days, and 9.2% at 90 days.5,6 In addition, patients who have a TIA are at risk of subsequent MI (1.7–2.7% per year7) and death (27% at 5 years in the Oxford Vascular Study 8). Transient ischaemic attack is, therefore, a medical emergency and should be treated with the same kind of urgency as unstable angina. A TIA clinic is a one-stop specialist clinic where patients should, ideally, be seen on the same day as symptom onset if the ABCD2 score1 is ≥4 (see text under heading 'The ABCD2 score', and Table 1, below). As TIA and stroke are part of the same disease continuum, the TIA clinic is the ideal setting for management of minor/non-disabling strokes (strokes that do not need admission) in the most efficient manner. An ABCD2 score ≥4 is now considered to be high risk (patients expected to be seen and treated within 24 hours); a score of <4 is considered to be low risk (patients may be seen and treated within 7 days of onset). After confirmation of the diagnosis and necessary investigations, all secondary prevention therapy is prescribed and started immediately. Typically, this includes antiplatelets, antihypertensives, and statins.14,15 Transient ischaemic attack clinic management also includes immediate anticoagulation for atrial fibrillation (AF) after brain imaging has been used to exclude haemorrhage or other pathology.14,15 The novel oral anticoagulants are often preferred in TIA clinics because of their immediate onset of action. 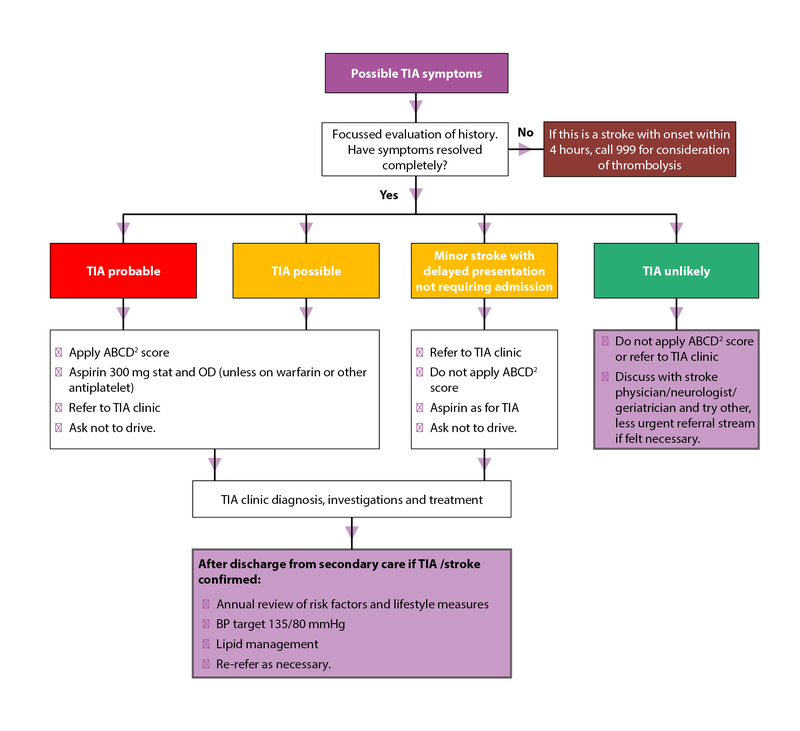 The TIA clinic should not be looked upon as a 'funny turn' clinic, a convenient way of getting a quick neurology opinion (most stroke physicians in the UK are not neurologists), nor an easy way of getting a CT head scan; careful assessment by the referring practitioner is important and a concise guide to diagnosis is given below. Transient ischaemic attack is a clinical diagnosis almost always based on the history and its interpretation by the examining clinician. The symptoms can be very fleeting and the patient's recollection may be poor; terms such as 'heaviness', 'numbness', or 'dizziness' mean different things to different people. An accurate diagnosis of TIA involves taking a focused and critical history and working out the true significance of often very brief symptoms that patients find it difficult to explain. The clinical examination does not usually help because the symptoms have often resolved by the time the patient is seen. In fact, most TIAs last a few minutes and rarely more than 1 hour; the finding of clinical signs and ongoing symptoms a few hours after onset suggests that the patient may have had a stroke, rather than a TIA. A TIA is usually of abrupt onset and symptoms reach their full extent and severity very shortly after onset.18 The symptoms should be focal symptoms (i.e. those expected from ischaemia in a distinct arterial territory in the brain): for example, ischaemia in the (usually left) middle cerebral artery territory may cause dysphasia and right-sided weakness. Transient ischaemic attack involving the retina typically causes transient visual loss in one eye. sensory symptoms confined to part of one limb or face. Table 2 (see below) lists some of the distinguishing characteristics of TIAs and mimics. applying the score to delayed presentations (i.e. beyond 7 days). A low ABCD2 score (if accurately applied) may help in screening out mimics, although with limited sensitivity and specificity.22 The ABCD 2 score, however, has been criticised for not taking into account other important prognostic features, including carotid disease, recurrent TIAs, AF and evidence of tissue damage on MRI. Also, the score does not prompt urgent assessment in patients on anticoagulants with suspected TIA, where urgent CT scanning to exclude a brain haemorrhage is advocated.14 It is possible that the ABCD2 score will assume less importance in the future as stroke services strive to see more patients who have a high probability of a genuine TIA on the day of referral, regardless of ABCD 2 score. Carotid duplex ultrasound is the most commonly used imaging method to detect extra-cranial carotid artery stenosis. This test is undertaken in patients with symptoms of carotid territory TIAs to select those suitable for carotid endarterectomy.3,14 Imaging of the vertebro-basilar system is more difficult and performed more selectively. The cardiac evaluation of TIAs is usually done using echocardiography and Holter monitoring in selected cases. The evidence base underpinning these tests is not very strong and clinical judgement has to be used in test selection. 3 If there is no cardiac history and if the cardiovascular examination and ECG are normal, the yield of transthoracic echocardiogram is lower than 3%.3 There is very little evidence to guide the timing of echocardiography after a TIA. See Figure 1 (below) for a pragmatic approach to managing a person with a suspected TIA. Primary care physicians should have a good knowledge of local TIA referral pathways. Various TIA referral systems are in place (e.g. telephone, faxed forms, online). 'Choose and book' is clearly not an option for TIA. Because the diagnosis of TIA can be uncertain, many stroke and TIA services have formal or informal systems to give advice. Neurologists or geriatricians may also advise, as appropriate. The NICE Clinical Knowledge Summary series on Stroke and TIA is a highly recommended source of essential information for primary care practitioners dealing with suspected TIA. 25 The 'Scenario: Suspected TIA' includes the recommendation to assess the ABCD2 score to identify patients at high risk (≥4), but to be aware that people with a suspected TIA who have AF, more than one TIA in 1 week, or who are on anticoagulants are at high risk too. See the full Clinical Knowledge Summary and Box 1 (below) for further details on managing people assessed as being at high and low risk of stroke. How should I manage someone at high or low risk of stroke following a TIA? if they are taking low-dose aspirin regularly, continue the current dose of aspirin until reviewed by a specialist. In people already on an antiplatelet, there is no evidence supporting an in-crease in the dose, a change to an alternative antiplatelet, or combining two antiplatelets. Advise them not to drive until they have been seen by a specialist (when definitive guidance will be given). † NB at the current time, clopidogrel does not have marketing authorisation for the management of TIA. The prescriber should follow relevant professional guidance, taking full responsibility for the decision. In-formed consent should be obtained and documented. See the General Medical Council's Good practice in prescribing and managing medicines and devices27 for further information. Adapted from NICE Clinical Knowledge Summaries on Stroke and TIA. See the full Clinical Knowledge Summary25 for further details. A TIA is a medical emergency and a diagnostic challenge for both primary and secondary care physicians. It is imperative to identify TIAs promptly because of the very high early risk of ischaemic stroke and this requires urgent assessment and preventive treatment in specialist TIA clinics. Most patients with TIA-like symptoms tend to present to their GPs. Guidelines do not deal with the difficulty in making the diagnosis of TIA; awareness of mimics and a careful analysis of the history are important to establish the diagnosis. There is no definite diagnostic test but investigations are useful to guide management and exclude other pathology. A higher a priori probability of TIA among patients referred by primary care and accurate ABCD 2 scoring should aid optimum management of this condition. In addition, primary care physicians have a very important role in the ongoing management and secondary prevention of TIA. Primary care physicians have a crucial role in the ongoing management of patients with TIA. It should be a priority for CCGs to commission effective services for TIA as prompt investigation and management can prevent serious stroke-related debility for patients and considerable health and social care costs for commissioners. these pathways should be built as specifications into contracts with local emergency providers including Out of Hours GP services, ambulance providers, and local acute trusts. CCGs should aim to commission 7-day rapid assessment services for TIAs using the Best Practice Tariffs for Stroke and TIA to incentivise this. The ABCD2 tool is of some use in prioritising high-risk TIAs but is not completely robust and the emphasis should be on rapid assessment for all TIAs within 24 hours. TIA (admitted) with complications £1256, without complications £552. Hankey G, Slattery J, Warlow C. The prognosis of hospital-referred transient ischaemic attacks.J Neurol Neurosurg Psychiatry 1991; 54: 793–802. Easton J, Saver J, Albers G et al. Definition and evaluation of transient ischemic attack. Stroke 2009; 40: 2276–2293. Chandratheva A, Mehta Z, Geraghty O et al. Population-based study of risk and predictors of stroke in the first few hours after a TIA.Neurology 2009; 72 (22): 1941–1947. Giles M, Rothwell P. Risk of stroke early after transient ischaemic attack: a systematic review and meta-analysis. Lancet Neurol 2007; 6 (12): 1063–1072. Wu C, McLaughlin K Lorenzetti D et al. Early risk of stroke after transient ischaemic attack: a systematic review and meta-analysis. Arch Intern Med 2007; 167 (22): 2417–2422. Touzé E, Varenne O, Chatellier G et al. Risk of myocardial infarction and vascular death after transient ischemic attack and ischemic stroke: a systematic review and meta-analysis. Stroke 2005; 36 (12): 2748–2755. Luengo-Fernandez R, Paul N, Gray A et al, on behalf of the Oxford Vascular Study. Population-based study of disability and institutionalization after transient ischemic attack and stroke: 10-year results of the Oxford Vascular Study. Stroke 2013; 44 (10): 2854–2861. Rothwell P, Giles M, Chandratheva A et al. Effect of urgent treatment of transient ischaemic attack and minor stroke on early recurrent stroke (EXPRESS study): a prospective population-based sequential comparison. Lancet 2007; 370 (9596): 1432–1442. Lavallée P, Meseguer E, Abboud H et al. A transient ischaemic attack clinic with roundthe- clock access (SOS-TIA): feasibility and effects. Lancet Neurol 2007; 6 (11): 953–960. Dutta D, Bowen E, Foy C. Four year follow up of transient ischemic attacks, strokes, and mimics: a retrospective transient ischemic attack clinic cohort study. Stroke 2015;46:1227-1232. Rothwell P, Algra A, Amarenco P. Medical treatment in acute and long-term secondary prevention after transient ischaemic attack and ischaemic stroke. Lancet 2011; 377 (9778): 1681–1692. Rothwell P, Eliasziw M, Gutnikov S et al. Endarterectomy for symptomatic carotid stenosis in relation to clinical subgroups and timing of surgery. Lancet 2004; 363 (9413): 915–924. Dennis M, Bamford J, Sandercock P, Warlow C. Incidence of transient ischemic attacks in Oxfordshire, England. Stroke 1989; 20 (3): 333–339. Nadarajan V, Perry R, Johnson J, Werring D. Transient ischaemic attacks: mimics and chameleons. Pract Neurol 2014; 14 (1): 23–31. Special report from the National Institute of Neurological Disorders and Stroke. Classification of cerebrovascular diseases III.Stroke 1990; 21 (4): 637–676. Angus-Leppan H. Migraine: mimics, borderlands and chameleons. Pract Neurol 2013; 13: 308–318. Owen D, Paranandi B, Sivakumar R, Seevaratnam M. Classical diseases revisited: transient global amnesia. PostgradMed J 2007;83: 236–239. Quinn T, Cameron A, Dawson J et al. ABCD2 scores and prediction of noncerebrovascular diagnoses in an outpatient population: a casecontrol study. Stroke 2009; 40 (3): 749–753. Wong J, Fotherby M, Eveson D. Comparison of ABCD2 scoring between first healthcarecontact and stroke-specialist physicians for transient ischaemic attack in a rapid-access clinic. Age Ageing. 2012; 41 (1): 115–118. Edwards D, Cohn S, Mavaddat N et al. Varying uses of the ABCD2 scoring system in primary and secondary care: a qualitative study. BMJ Open 2012; 2: 1–7. NICE website. Clinical Knowledge Summaries. Stroke and TIA. cks.nice.org.uk/stroke-andtia#!topicsummary (accessed 16 April 2015). NICE. Lipid modification: cardiovascular risk assessment and the modification of blood lipids for the primary and secondary prevention of cardiovascular disease. Clinical Guideline 181. NICE, 2014. Available at: www.nice.org.uk/ guidance/cg181 (accessed 13 May 2015). General Medical Council. Good practice in prescribing and managing medicines and devices. London: GMC, 2013. Available at: www.gmcuk. org/guidance/ethical_guidance/14316.asp (accessed 16 April 2015).